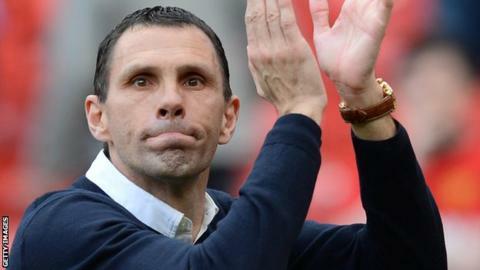 Sunderland boss Gus Poyet says it would be "crazy" if his side cannot preserve their Premier League status after winning 1-0 at Manchester United. If Chelsea beat Norwich on Sunday, Sunderland will be safe barring an improbable swing in their respective goal difference. "We are not over the line yet but it will be a shame if we don't stay up now," said Poyet. "It would be crazy to lose this opportunity." He added: "I don't know if I am going to be able to watch [Chelsea v Norwich] because I am going to be heading every ball." After the Black Cats drew at Manchester City and won at Chelsea in their previous two away games, Sebastian Larsson's first-half goal was enough to give them their first victory at Old Trafford since 1968. It could have been even better too as Emanuele Giaccherini and Fabio Borini both hit the woodwork after half-time. And even if Norwich carry the fight into the final week of the campaign, with home games against West Brom and Swansea to come, Poyet's team seem certain to preserve their top-flight status, something that looked impossible a month ago. "What we have done in the last four games is unique," he said. "Miracle was the word I used a few weeks ago. Apparently every now and again it happens." Although he did not get his name on the scoresheet, Connor Wickham still made a vital contribution, wriggling free of Darren Fletcher's attentions to swing over the cross Larsson turned in for his first Premier League goal of the season. Seven points away from safety as recently as last month, the goal meant Sunderland racked up three straight wins in the league for the first time in over two years. Poyet also revealed the revival had been accomplished with a squad containing 10 players who are out of contract in the summer. "How easy would it have been for those players to give up and start thinking about next year, about the next challenge and the next club?" he asked. "But they are here, fighting for the club and the fans. "They don't want to go down. They are not going to accept it. "That makes me feel very proud."